American toads accounted for about 80 percent of all anurans captured during the study. Photo by David Orr, courtesy of Flickr. 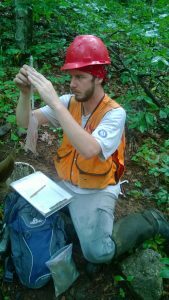 Greenberg‘s research portfolio includes many studies, each focused on different aspects of how management practices and natural disturbances change forests and, in turn, the animal communities they shelter and support. 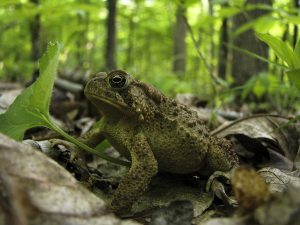 The current study is the first to experimentally assess how the season of a prescribed fire might affect the relative abundance of some common amphibian and reptile species. 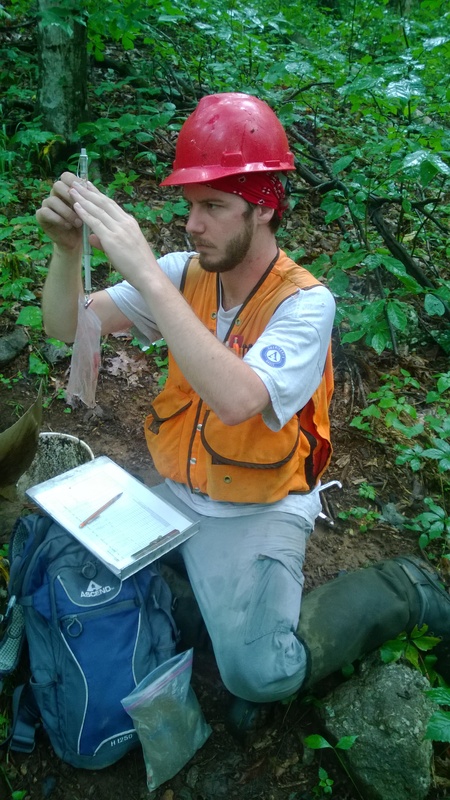 Greenberg is also studying breeding bird response, and other SRS scientists are examining how vegetation – mature and regenerating trees, shrubs, and herbaceous plants – respond to season of burn. Greenberg’s study was a partnership with research foresters Tara Keyser and Henry McNab, along with Tyler Seiboldt – at the time a graduate student at the University of Texas at San Antonio, the Pisgah District of the Pisgah National Forest, and others. Their findings were published in Forest Ecology and Management. Scientists installed 27 trapping arrays, each with radial drift fences and six pitfall traps. Photo courtesy of Tyler Seiboldt. The research team worked with Patrick Scott, fire management officer on the Pisgah, to conduct prescribed burns within the study area in Bent Creek Experimental Forest. The study site was a mature, closed canopy forest dominated by upland hardwoods such as oaks, sourwood, red maple, and a few shortleaf pines. The experiment included three forest stands burned during the growing season (April 2013), three others burned during the dormant season (March 2014), and three stands that were left unburned as a control. 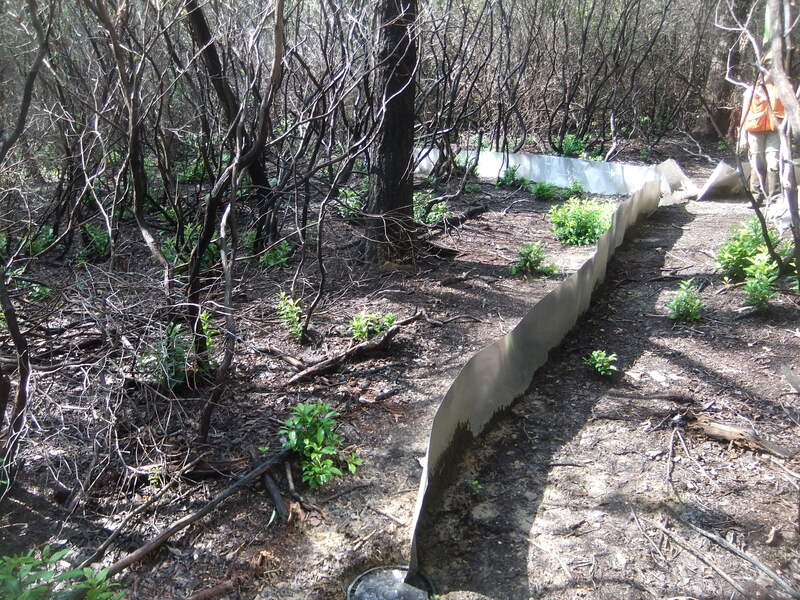 In each treatment area, Greenberg and her colleagues installed drift fences and pitfall traps. These structures were open day and night, from mid-May through early August 2013, 2014, 2015, and 2016. All captured animals were identified, measured, and released. The team captured 489 amphibians of 12 different species. American toads, southern Appalachian salamanders, and red salamanders were the most commonly captured amphibians. Reptile captures included 192 individuals of 10 different species. Five-lined skinks and eastern fence lizards were the most commonly captured reptiles. 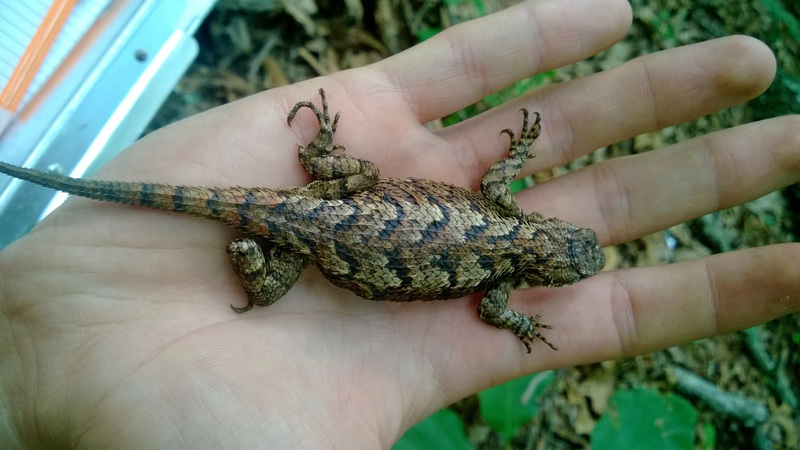 The eastern fence lizard is common across much of the Southeast. It perches on tree trunks and branches during warmer months of the year. Photo courtesy of Tyler Seiboldt. Greenberg and colleagues statistically analyzed the amphibian and reptile capture data across years and burn treatments. The growing season burns resulted in some small canopy openings, which explains the greater abundance of lizards – especially the five-lined skinks – in those sites. Amphibians need moist microenvironments and are more sensitive to changes temperature and humidity. Even so, the scientists did not observe any adverse effects of either growing-season or dormant-season burns on terrestrial salamanders – often considered a forest health indicator – or other amphibians. Seiboldt weighs one of the captured herpetofauna. Photo by Chris Adkison, University of Texas at San Antonio. This study is one piece of a growing body of research examining how forest disturbances affect wildlife. “Large disturbances can substantially reduce the forest canopy, whereas others, such as low-intensity burns, may not. Changes to forest structure are key to how different wildlife species respond. Of course, forests regrow, so many of the changes to wildlife communities can be short-term,” says Greenberg. At Bent Creek, more growing-season and dormant-season prescribed fires are planned for the season of burn study. Related studies are addressing the effects of repeated prescribed burning or wildfires on forests and the wildlife communities they sustain. “Understanding how reptiles and amphibians respond to growing- versus dormant-season burns helps us make ecosystem restoration or forest management decisions that also meet wildlife conservation goals,” adds Greenberg.